This year's Google I/O covered just about every major application of consumer technology -- mobile devices, wearables, TVs, automobiles, etc. It would be difficult to go through every single release, so I'll restrict myself to the major announcements. 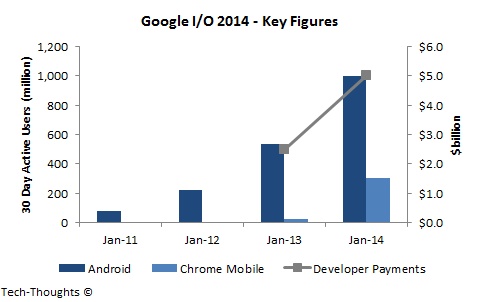 Google clearly made some huge strides this year, but a few announcements also left me puzzled. Let's start with the clear wins. Android 5.0 (or is it 4.5?) received a complete visual refresh that designers should be very happy with. Google has attempted to create a unified design language for native apps and the web, which should help streamline the user experience. This was clearly an attempt to create a more "premium feel". While the design overhaul is a good step, it becomes even more important with the AndroidOne announcement. In essence, it's a set of hardware reference platforms to build cheap stock Android devices that are updated directly by Google. Think of it as an expanded Nexus program with a low-end focus. While there are other reference designs available from chip manufacturers, it is a mistake to dismiss the significance of this announcement. Most low-end designs (even reference designs) perform poorly because of the firmware. With Google in direct control, device performance should see a significant boost. With the Moto G and AndroidOne, we may soon see multiple devices priced at ~$100 that outperform $300-$400 devices from bigger brands. This will allow low-end vendors to move upmarket and compete against larger OEMs. This may also increase pressure on Samsung and mid-tier vendors to become part of the Android Silver program. The result -- fewer barriers between consumers and Google services. Google also showed off the early stages of a potential merger between ChromeOS and Android. This move could have potential as tablets have struggled to displace PCs in scenarios where productivity matters. The combination of keyboard input, Google Docs and the ability to run Android apps should give Chromebooks a boost in the lightweight productivity segment (education, for example). This critique isn't specific to Google, but I don't quite understand the point of wearables (not to be confused with "field of vision" devices). It occurs to me that OEMs need wearables far more than consumers do. With the smartphone industry becoming more competitive, every hardware company seems to be looking for a new category. Unfortunately, the value offered by these devices to mainstream consumers is very limited. The very fact that users look at their smartphones 125 times a day tells me that they don't need another intermediate device to look at (unless it's at throwaway prices). Because of the number of sensors these devices carry, many observers think that they have potential to disrupt healthcare. Analysts usually talk about two specific areas -- fitness and preventive medical care. Fitness trackers have been out for years and seem to cater to a niche market. There could be additional sensors that monitor blood sugar and other useful data points. But these mean very little to users without meaningful outputs in context of their medical history. From a mass market perspective, new product categories are only valuable if they offer benefits unmatched by other product categories. They key term here is "benefits", not data points. Could developers use Google Fit or HealthKit APIs to put this data in context? I certainly hope so. In my last post, I showed that Google's motivations to infiltrate the living room may be unmatched. However, I had doubts about their approach to distribution. Google seems to have chosen the route of a modular platform for TV and they've already proved me wrong by signing up partners like Sony who have their own platforms. They may be able to attract more hardware partners if device sales pick up. Their UI decisions seem to be sound and their focus has shifted to content rather than apps. Gaming and cross-device support seem to be a major focus as well. In a way, Android TV has effectively become a modular competitor to Fire TV. It seems like this 3-way ecosystem battle will be decided on two fronts -- device ownership and TV-specific content.